Shooting hoops, a photo by The Bacher Family on Flickr. It's been a fun challenge figuring out how to take good action photographs in a gymnasium. For one thing, the light is fairly dim -- human eyes adjust well, but cameras tend to want to take photos with relatively snow exposures that don't stop the action very well. I am grateful for my new Canon EOS 5D Mark III, without which photos like this one would not even be possible. With the 5D I can shoot at high ISO (3200 here) without losing a lot of image quality, and with my 85mm/1.8 lens I can gather enough light to allow photographs as fast as 1/1000 of a second, enough to stop the action. The tradeoff is a very narrow depth of field, but that's not such a bad thing either when there is an audience and advertisements and lots of other distractions in the background that you want to blur away anyway. 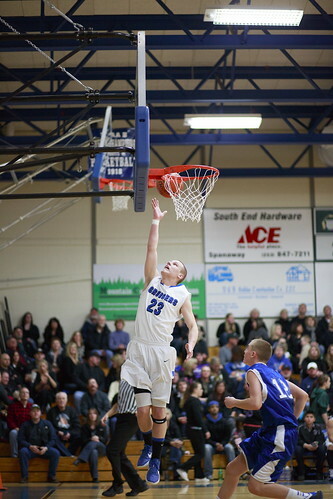 Here's one of my best images from early in the basketball season. The season has progressed well, and we're on our way into the playoffs seeded 3rd in the league. You can see more recent photos on my Facebook page at facebook.com/thelightisall.